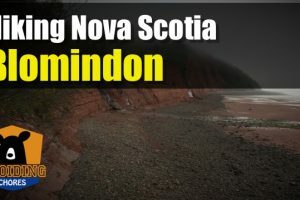 I teamed up with Expedia Canada to check out some great day hiking spots which also happened to be near some of the local craft breweries that are sprinkled across Nova Scotia. 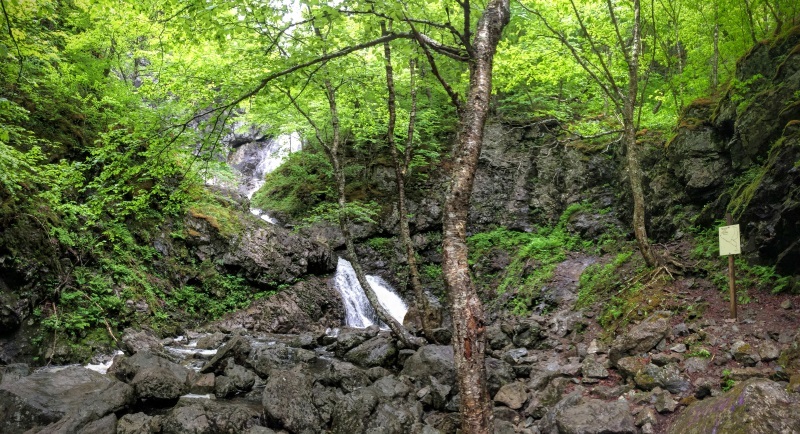 With the rugged coastline and killer views around Nova Scotia, exploring waterfalls within a day hike is one of those little pleasures as the exploration level is set to high. 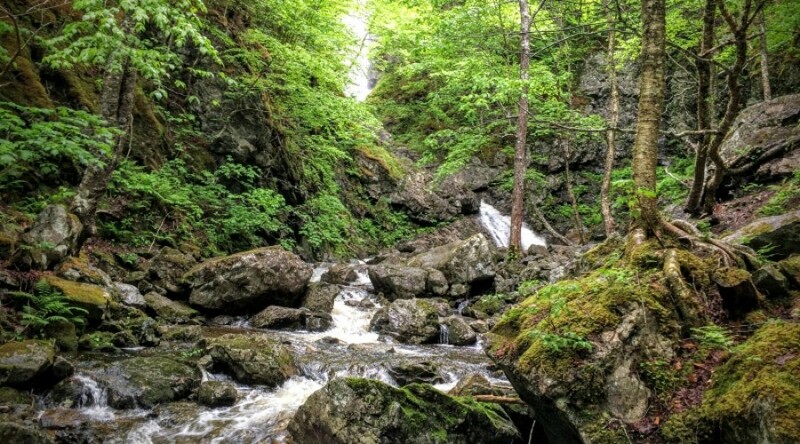 So with my maps in hand, I narrowed my waterfall search around Baddeck, Cape Breton. 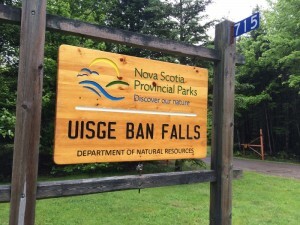 Uisage Ban Falls Provincial Park is located at the outer edge of the famous Cape Breton Highlands, barely a 20 minute drive from main street Baddeck.While there are plenty of things to do in Halifax, I packed up the car with my four legged buddy (Keji the black lab) and left Halifax for the 3 ½ hour drive to the trailhead. You can’t miss where to go. 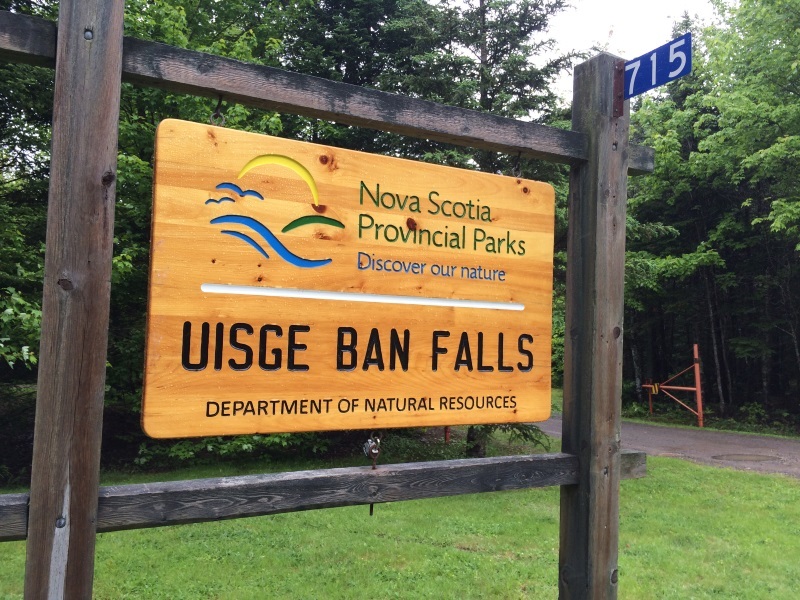 Uisage Ban Falls or “OUSKA-BAN” falls is part of the Gaelic tradition that you will notice along the highway as soon as you cross step off the mainland via Canso Causeway and follow the Trans-Canada Highway to Exit 9. You don’t really need your GPS navigation to find this day-use park; It’s a straight line as soon as take the exit and turn left. And besides, cell service will become spotty as you start the enter the wilderness. 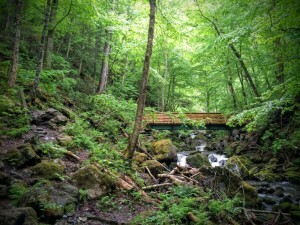 Most of the hiking is along well groomed trails. A small parking lot next to the trailhead makes it easy to load out and get started. A few picnic tables and pit toilets are within reach. I arrived after some heavy overnight showers, so not only was the scenery was still overcast and cool, the falls should be fairly noisy. Visiting the park during the fall colors season would be amazing. 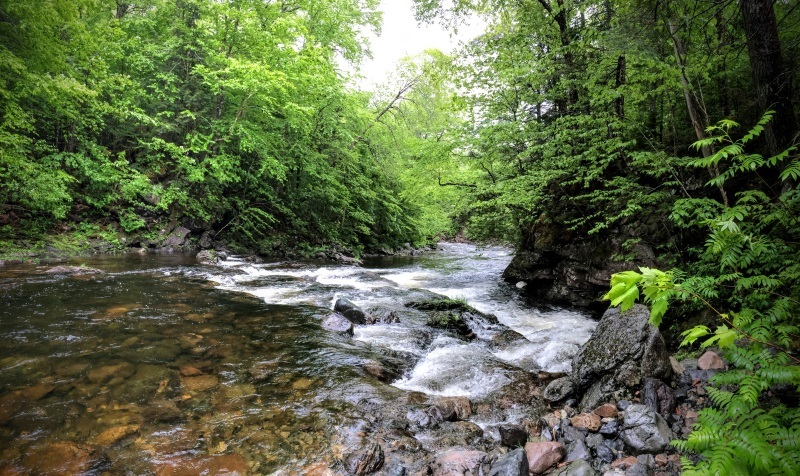 There are two trails to explore within the park: the quick out & back to the falls and a longer loop trail along the North Branch Baddeck River. 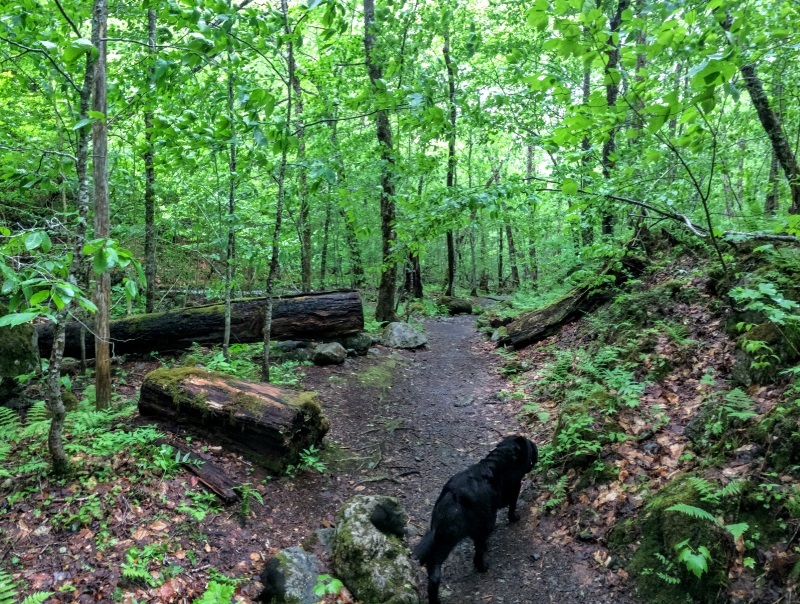 My hiking buddy and I decided on doing both trails which would total almost six kilometres. We followed the path along the River Trail where all you could hear is the water running down its course. 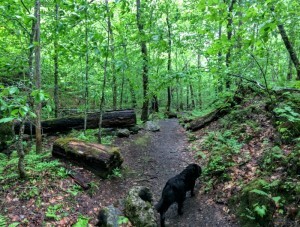 The spruce & pine forest slowly changed to a mixed hardwood. Mental Note: Visiting the park during the fall colors season would be amazing. Many views are along the River Trail. Once we finished our loop, the trail connected about ⅔ of the way up the Falls Trail. At this point we were following Falls Brook and a short 400m hike to the granite gorge. As we got closer, the terrain shifted from the easy gravel trail to rugged footpath as we made our way across rocks and tree roots. 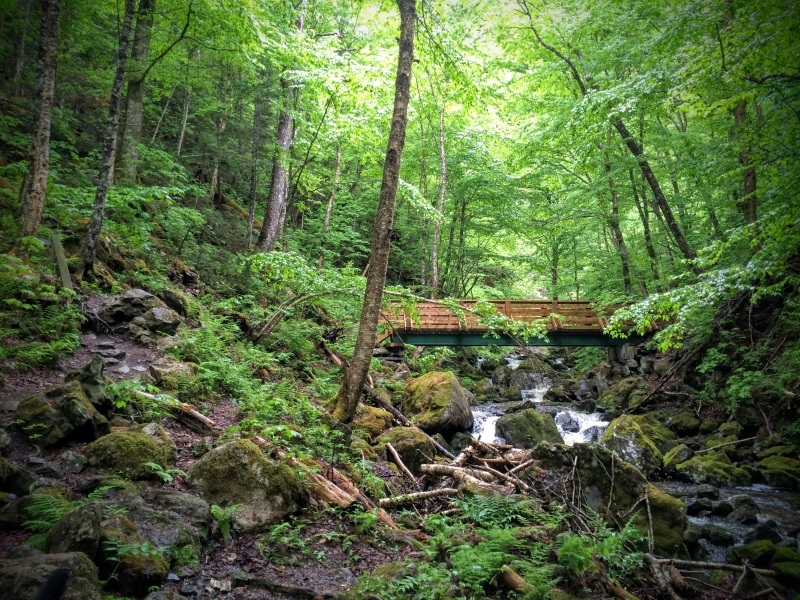 You know you are close when you get to this foot bridge. And there we were, deep within the gorge seeing the cascading water flowing & crashing down. My hiking buddy took advantage of the cool water to enjoy a dip in several of the pools that had formed over time. Thoroughly enjoying the scene; the walk back to the car via the Falls Trail capped off a great hike. But the hike created a thirst that my water bottle couldn’t quench. Only 25 minutes away was one of the many craft breweries that have been sprouting across Nova Scotia. 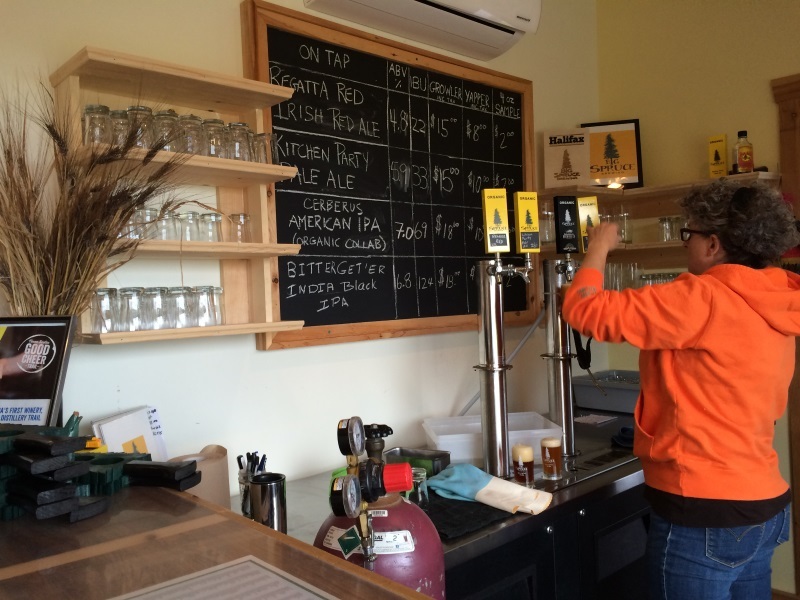 We set our navigation skills for Big Spruce Brewing in Nyanza. 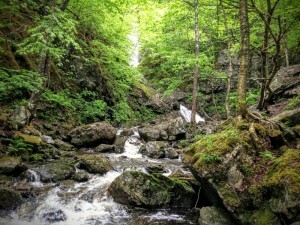 Can you tell where the falls start? Look up, way up! The atmosphere was mellow and it was easy to get caught up and upload some pics from the hike. Literally 30 seconds off the main highway, we pulled in and in very short order was in the tasting room with a sample tray of their latest brews. From the tasting room, I looked out towards the Bras d’Or Lake. From here, I noticed my cell had regained its contact to the world and my notifications started coming in. Big Spruce is a certified organic brewery and farm, growing their own hops. The atmosphere was mellow and it was easy to get caught up and upload some pics from the hike. 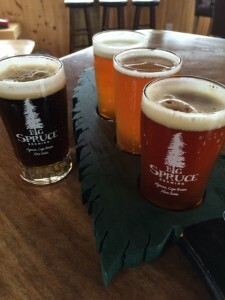 Enjoying some samples at Big Spruce’s tasting room. Regatta Red – Irish Red Ale – 4.8% – This was a smooth, easy drinking beer. A little bit or toffee with a small hop aroma. Kitchen Party – Pale Ale – 5.9% – A pretty bitter ale, as you get both citrus and pine. This one had a great aroma. Cerberus – American IPA – 7% – Now this was a nice organic collaboration brew with two other breweries. The aroma and decidedly very hoppy beer with a smooth finish was my favourite. Bitter Get’Er – India Black IPA – 6.8% – This one is for those who like the coffee, malt flavours and with a good smack of hops. With my visit to Big Spruce done, we were back on the road so that we would arrive at Halifax around supper time.